I find that I love this particular commercial. Well, rather than explain, just watch. Reality is quite different from supposition. So often what we hope for is magic and however cute, magic is false. The real thing is deep faith yoke to great commitment, daring sacrifice and the enlivening presence of God in Christ through the power and presence of the Holy Spirit. It is not magic at all but God at work in and through faithfulness and fruitfulness. I rise near the close of my first quadrennium as bishop here in the Central Texas Conference to give thanks to God for you. The words of the Apostle Paul echo down the centuries and into my heart and mind as I reflect on my brief time among you as your bishop. “I thank my God always for you, because of God’s grace that was given to you in Christ Jesus. . . . God is faithful, and you were called by him to partnership with his Son, Jesus Christ our Lord." Then there is the incredible witness of the pastors and children’s staff at St. Barnabas in Arlington leading the children to safety singing “Jesus Love Me” moments before a tornado hits. Not only was no one hurt but despite the wreckage (St. Barnabas is still not worshipping in their sanctuary), they and our disaster relief team of volunteers is helping rebuild the area and sharing the love of Christ by word and deed. In demonstrating the connection at its best, UMCOR (the United Methodist Committee on Relief) had contacted and cut a check along with Conference funds to help within hours of the storm. Or consider a courageous group of lay leaders meeting to examine the future of the predominately African American United Methodist Churches in the Fort Worth area. We don’t know where that will come out but I celebrate their vision and leadership as a clear example of forward thinking lead by the Holy Spirit. All of this and yet so much more is evidence to the mission of the Central Texas Conference. I cannot say this enough. Job one for the Conference, lay and clergy leadership, staff and structure is to energize and equip the local church. Local churches live with the vibrant mission of making disciples of Jesus Christ for the transformation of the world. 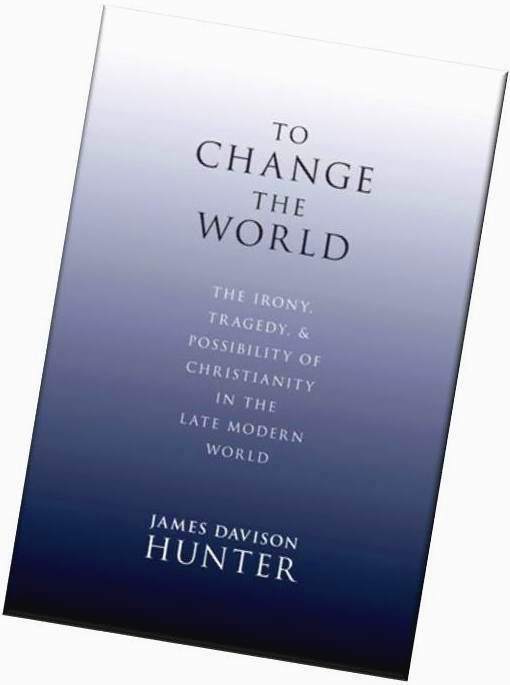 One of the more fascinating pieces of reading I have done this past year was James Davidson Hunter’s book To Change the World: The Irony, Tragedy, and Possibility of Christianity in the Late Modern World. In it, Dr. Hunter demonstrates the clear connection between a vital faith and a vital community of faith. This business of being Christian alone and by one’s self is not just unbiblical it is impossible. We can’t do it alone. We aren’t meant to do it alone. Jesus nailed the truth when he said, “Where two or three are gathered in my name, I’m there with them.” One of the heresies of our age is this notion that someone can be Christian and spiritual on your own. It is just not so! Perceptions of the recently concluded General Conference very widely. I have shared my own in a number of blogs which you can find at the conference website. My personal quick summary is that our governance structure is deeply broken and yet the ministries we are engaged in together are glorious. A colleague Bishop has commented, “Our general church processes and procedures have become so complex, intertwined and self-perpetuating that we became like a spider entangled in its own web. We became so ensnarled in our rules, regulations and special groups that we were paralyzed to act. Structural unity became an obstacle to our mission. In the end, we simply could not deal with the reality of our decline here in the U. S.
Let me offer just one indicator of the urgency of our dilemma. During the last five years—since the last General Conference plus one year, worship attendance in the U.S. declined 8.7% or almost 300,000 people. Membership decline is a much bigger number. We are talking worship attendance loss over five years—almost 300,000. Folks that is reality and while we should not panic over such loss (sustained over a 44+ year period to date) neither should we live in blissful denial. Neither panic nor denials are faithful strategies and fruitful practices. At the same time, as I have repeatedly asserted, glories ministries are taking place. Reality includes over 612 new church starts in the United States (a vast increase! ), significant movement forward on leadership development, ministry with the poor and Imagine No Malaria. This is not a time for despair or denial but rather for dedication and determination. The focus must stay on local churches as the biblical locus for making disciples of Jesus Christ for the transformation of the world. The Central Texas Conferences had a worship decline of 488 in worship attendance. That is about 1 percent and means we closed a church roughly the size of St. Barnabas. Conversely we are up that 1 percent since 2009 (the statistics GCFA are quoting). A certain amount of this is natural fluctuation but in our growing population environment, we should be growing. Every category save one is up! They are not only up but up substantially. Well done thou good and faithful servants! The member churches, both lay and clergy leadership, are to be congratulated. 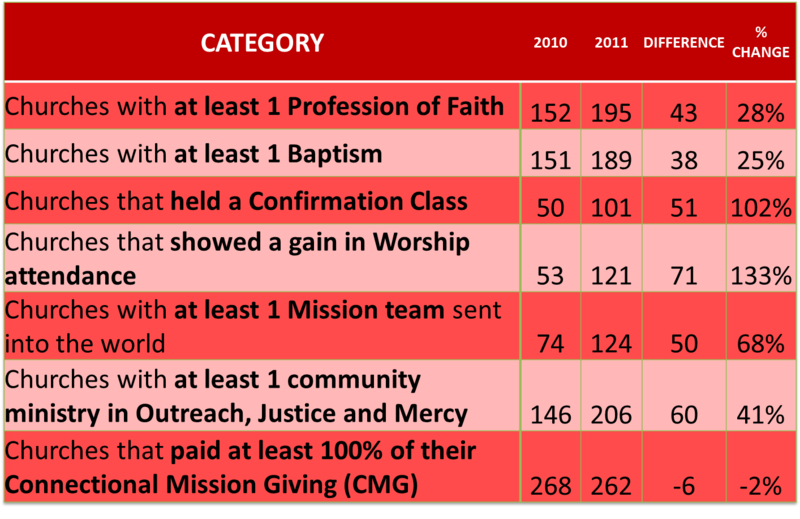 Represented within this report are the five practices: radical hospitality (profession of faith, baptism), passionate worship (worship attendance), risk-taking mission (mission team & community ministry in Outreach, Justice and Mercy), intentional faith development (baptism, confirmation class) and extravagant generosity (Connectional Mission Giving). It is worth noting that 285 of our 305 chartered churches have completed their Vital Congregations sign up. Narrative is crucial and must be yoked with metrics. The two go together like salt and pepper. Narrative is the story, the background information, which helps understand what is taking place. Often (usually!) the narrative changes before the metrics. What does this look like? A pastor and congregation(s) start discovering and sharing with each other stories of significant mission impact in their life together (i.e. “remember when we were helping that homeless family find a meal” or “it was moving to hear Jimmy talk about the difference that following Christ has made in his life” etc.). One of the keys to understanding narrative is that it is a specific story. Narrative is not a vague assertion. 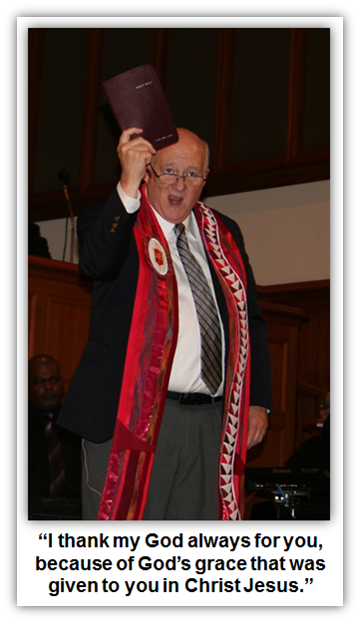 It tells a tale of God in action in the life and ministry of a congregation and individuals. In our use of the vitality metrics, we (Bishop and Cabinet) have left a large place for the narrative story to be shared. It is critical piece of learning for us as a Cabinet, for pastors, and for lay members of a congregation! Narrative begs to be shared! As we continue to implement the Exodus Project leaning into the future, it is important to ask what have we learned to date? Our formal review is a couple of years off (as voted in the adoption of the Exodus Project legislation). For now, here are some insights we’ve gained. 1. Our cluster group model simply hasn’t worked. I still strongly believe in the basic premise of peer learning. But we have learned that without a leader and/or facilitator, groups are just not able to self-organize and move forward. 2. Our new peer learning groups are being structured around the Healthy Church Initiative and its special component called the Small Church Initiative. We are investing more time, money, and resources in the learnings that come from HCI Pastor Leadership Development groups and HCI Lay Leadership Development groups. 3. Change is loss, this we know. As we move forward we hope to engage more healthy churches in Partners in Ministry a lay driven forum for guiding congregations and pastors to work together in ways that are healthy and challenging; ways that honor loss and engage the new future before us. 4. Now more than ever, I am convinced that we need to engage in a coalition of the willing. This is not a new insight. It is a strong reaffirmation of the importance of voluntary engagement. 6.Continued learning for the Cabinet, including myself, as we live into a new way of leading the church. We are already engaged in wide-ranging experiments with things like Charge Conferences, Co-operative Parish church models, parenting models, and multi-site models. 7.Leadership development we continue to a major emphasis as we live into a new future. 8. 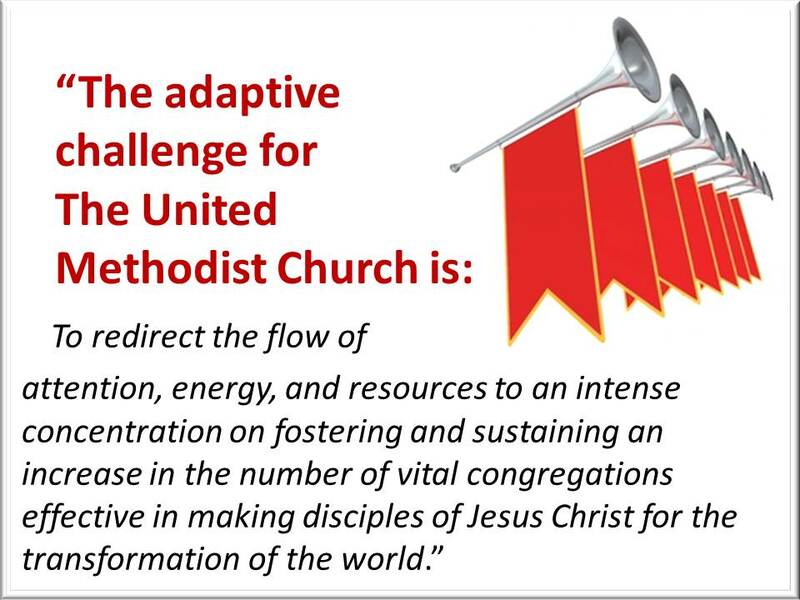 We are in the beginning stages but together we have to understand, learn and develop the District Superintendents and Conference staff as mission strategists who work with congregations that are willing to engage in 21st century ministry. We will increasingly move in the direction of appointments not just to local churches but to the mission field as a whole. 9.Recruitment of new clergy for a new generation while celebrating the wonderful ministry of those already serving in clergy leadership. Clergy, as a profession, a calling!, we are retooling in the midst of the action. This is tough but it is also a time of wonderful opportunity and creative excitement. Laity, your support and partnership is needed now more than ever! Furthermore we must also actively recruit and employ a new generation of lay leadership while leavening that leadership with the wisdom and experience we have been blessed with in abundance by so many of you. There is more, but this at least sketches the outlines of our new learning and continued challenges. Instead of continuing, allow me to pause and off a great new resource. 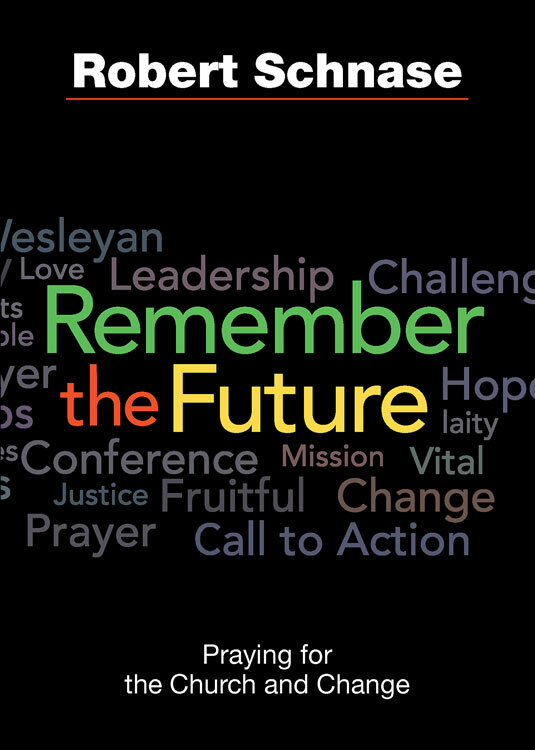 I am asking that the tellers pass out to ever delegate a copy of Bishop Robert Schnase’s new book Remember the Future. We have received this book in major part due to a special pricing by Cokesbury and Abingdon Press (our United Methodist Publishing House) and a generous grant from the Texas Methodist Foundation. As you get your copy, I urge you to thank the folks at Cokesbury and our wonderful ministry partners, the Texas Methodist Foundation. Turn to the top of page 31 and follow along as I read. Share your answers with those sitting near you in triads. Now turn to page 39 and read the second full paragraph. Then flip to the bottom of page 41 and the top of page 42. Try to answer the questions listed there with your triad neighbors. This is a great exercise for an Administrative Board or Council to do together. It gets at the heart of faithfulness and fruitfulness in ministry. One last exercise; flip to page 97. Try sharing some answers to the questions listed with your triad partners. Folks, this simple little resource is cheap (inexpensive), Cokesbury will work with you on getting copies for your leadership group – Board, Council, PPR Committee etc. It is explicitly designed and written to be used by a local church. And on top of all that it fits perfectly with the essential teaching insights of Bishop Schnase’s earlier work The Fruitful Practices of Faithful Congregations and with the HCI learning material and Dr. Bob Farr’s Renovate or Die. Try it. You’ll like it and your ministry will be more faithful and fruitful.